I waited until Sunday to make my recipe for today. That is kind of cutting it close. Had I given myself more time I probably would have tried the recipe again and hope for better results but as it is....you gets what you get. So I gathered all the ingredients that I wanted to include in my Spring Rolls. 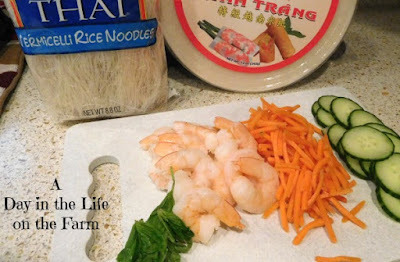 I had rice noodles, shredded carrots, shrimp, basil and sliced English cucumber. I also had a package of rice paper wrappers. Now, Mark's guidelines said that you should soak your spring roll wrappers for 10 seconds. Well, they folded all into themselves in a globby mess. So I turned to google and found a video that said you should turn them through the water like you are driving a car, until coated and then fill them. This worked a little better as far as putting them together. But they were not the "beautiful feast for the eyes" for which Asian food is known. I think making them beautiful comes with time and practice. Mine looked more like shrimp and veggies wrapped up in a condom. It was a little off putting, I must admit. As if that wasn't bad enough, they were extremely sticky. So sticky that we had to resort to eating them with a knife and fork. I served them up with some Sweet Chile Sauce. They were tasty enough but we had a hard time eating them between guffaws. I was glad it was just Frank and I and that I hadn't anyone else for dinner that night. Frank said they tasted good but it was kind of like eating boogers.....I'm still trying to wrap my head around the fact that he knows what boogers taste like. I have to go now....I have tears running down my legs from writing this post. Don't forget to stop by and see the other Spring Rolls being shared today.....I am sure they are much better than mine but I'm sure they didn't have as much fun with theirs LOL. 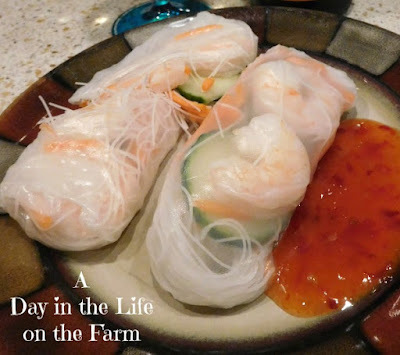 I am not sharing my recipe because, trust me, you don't want your Spring Rolls turning out like these but I will keep working on it and when I have it figured out....I will post a recipe! Oh, Wendy! So sorry. I linked you in (you hadn't) because kitchen fails are part of what make us better cooks. You'll figure it out. Hugs! Condoms and boogers. I’ll never look at spring rolls the same. 😀 actually if you weren’t so honest, these look pretty good! Bit an does assume we know a lot. Better instructions on the dipping and wrapping would definitely have helped! My last attempt at spring rolls also resulted in super tacky rice paper. I didn't have the image of a condom in my head, but I will next time, haha. Ha!Ha! Loved the imagery here! OMG Paula, we were laughing so hard we could barely speak.